I only ever got to see Descent played over the shoulders of family friends in the ‘90s. PC gaming equipment was smuggled into our house under the pretence of word-processing, and a joystick would’ve been a worryingly explicit statement of intent. The impression I had, of first-person cockpits navigating blocky labyrinths in which any direction could be up, appears to have been accurate. A team of extraplanetary game veterans has assembled to plunge us once more into single and multiplayer space mazes. The new Descendent Studios is made up of staff who’ve individually helped develop a silly number of space games. Name a Star – Lancer, Citizen or Wars – they’ve worked on it. There doesn’t seem to be much original Descent blood on board, oddly – but there are several veterans of Wing Commander’s Origin Systems involved, and that’s good DNA. 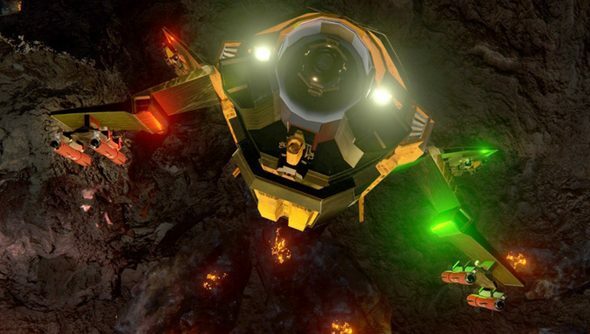 Underground’s set-up finds rival corporation pilots fighting over resources in a cramped, voxelly asteroid field. There’ll be plenty of opportunities to get lost in 3D environments, and six degrees of freedom – the ability to rotate on three axes that’s remarkably still a rarity in contemporary gaming. Specific ship types can drill through walls in the landscape. Or they can be customised for scouting, or mashing through armour. The idea is to provide complex options for offensive and defensive configurations – and make ships upgradable through tech trees. It’ll all be built in Unreal Engine 4, and the team are predictably enthusiastic about the prospect of VR. Descendent are halfway to their goal with 11 days to go, and pitching (and yawing, and rolling) for a March 2016 release. Think you’ll dive in with them?